New York! New York! Somewhere I’ve never been. And would like to visit. Particularly this week. Fellow book bloggers are gathered together for the Book Expo America (BEA), a few days looking at the joys of blogging. And how to improve the joy. Which can only benefit us all. And while I would prefer to be there in person, of course, modern technology – and a jolly nifty group of bloggers – have made it possible to have a cyber presence. The Armchair BEA. How cool is that? I’m a life-long book lover, blogging for just over a year now. I'd been meaning to blog for a while. But being a professional procrastinator, it wasn't happening. Until I was housebound by a (very silly) accident last year. To stave off boredom and insanity, I launched myself into the blogging arena. And I’m loving it. I love reading. I love writing. And I love musing about the books I read, the words I see. I love it that someone somewhere is sharing these thoughts and musings. I am delighted when someone shares their thoughts and musings through comments. When page hits become human interaction. I'm doing the Classics Challenge this year (through to 2017) and am loving discovering new authors such as Nathaniel Hawthorne, Goethe, Dickens. Dahl. I'm even enjoying discovering authors I don't particularly appreciate, such as Virginia Woolf. 4. Which is your favourite post that you have written that you want everyone to read? 5. If you could eat dinner with any author or character, who would it be and why? Milan Kundera. Love his books, love his vision. He has an incredible mind. Has lived an amazing life. Seems to have a good sense of humour. What more could you ask for? Roald Dahl writes some amazingly creepy stuff! Enjoy Armchair BEA. Oh, I would love to visit France one day! You live in an amazing area! I'm so glad you're enjoying blogging - the book bloggers are a great community and it I agree ... it is so fun to be part of it all. I hope you'll get to visit New York "in person" someday - it is one of those cities everyone should see at least once! Well, at least we have Armchair BEA to keep us company this week, so we won't be too sad about being so far away from the real thing! Lovely to meet you ~ TY for stopping to chat at FHC ! Would love to be at your dinner party with JA , Edith, etc.. That would be one fantastic evening! Strasbourg looks beautiful in those pictures! I'm definitely happy to have Amrchair BEA this year because I was sooo close to getting to go this year, and it stings a little :P I hope you enjoy this week! I think I may need to join the Classics Challenge next year. Haven't read one in awhile. I also started blogging with no particular intention but here I am, three years down the line, with 2 blogs and many, many posts. Don't worry - nobody ever knows where Strasbourg is! I almost visited France a few years ago when I was in Europe, but wasn't able to fit it into the trip. But someday I'll get there! What's your favorite classic? I love Roald Dahl's work! He was such a fantastic author. Strasbourg looks like a lovely city, I would love to visit its Christmas market! Seeing Goethe reminds me of a project I had to do on his life a couple of years ago...I never did get round to reading his work. So not jealous you live in France, nope not at all! (I'm very jealous.) Great choice of authors to have dinner with, it would be so stimulating to talk to them! Thanks for stopping by my BEA post! I am planning to try Virginia Woolf soon (Orlando), but I definitely find her intimidating. Hello!! I LOVE France. :) I was just in Paris and Toulon last spring, and you have the most amazing bakeries. It's not nearly as fun eating pastries here in America anymore. Our blogging stories are quite similar, actually. I decided to open my solo blog in the middle of recovering from my tonsillectomy. It's amazing the ideas we come up with when we're bored! It's an unfortunate story that brought you to the blogging community, but I'm glad you're here and that you're enjoying it! I love it too. :) So nice to meet you! Thanks, Jana! So pleased to be part of it all. Good things certainly can come out of adversity. As for the bakeries, they're good but v dangerous to the waistline. Constant temptation...! I love that GRRM quote! Definitely one of my favorites from the books. I wish that I could chat with Jane Austen, even if it was just for a few minutes. So much genius in her novels. The quote you have at the top is a favorite of mine and so true! Readers get to live so many lives through books! Best of luck on your classics challenge! 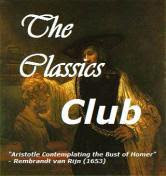 I would love to read more classics but I have found that it's hard for them to keep my attention! I read Kundera decades ago in French, I guess when it was very fashionable to do so, lol, and I really loved it. please invite me for that dinner, lol! We're both book bloggers AND professional procrastinators, yay! ;) I've been blogging for just under a year. It's one of the best decisions I ever made. I love George R.R Martin!the songs of ice and fire is definitely one of those series I'm glad I got into.I'd like to visit France some time and thanks for sharing those beautiful photos. Hey there, Kim. Thanks for stopping by. Glad u liked the photos. I love photography, but sometimes fall short. Quite pleased with those though. And you really must get to France. It's an amazing country. Where are you at? Have you recovered from your accident? I made my blog when I was tired of boredom, as well. France?! My top 3 places to visit before I die. Do you live in the city or on the outskirts? I love the photos you took! You are reading a lot of the works/authors I had to read in high school. I was in the International Baccalaureate program, so there was a heavy influence of world-wide classic authors. I probably would've enjoyed them more if we didn't have to analyze every single sentence haha! Hope you have a great week and enjoy Armchair BEA! The recovery continues, but I'm almost there. Thanks for asking. I'm in the suburbs of Strasbourg, not far from the city centre (it's not a big city). Very pretty. As for high school reading lists, one of my beefs is that some of the reading is way too heavy for youngsters, and instead of stimulating them to read, puts them off forever. I hated some of the books we did in school. But re-reading them now, I love them! Not at all a silly question, Monika. The official language is French, but many people here speak Alsatian, which is an odd combination of the two, although more germanic. And lots of people here speak German too. It's bizarre being so close to the border. I do my shopping in Germany! !